It can be difficult to find yellow wax beans in some areas. Consider buying them fresh in season from farmer's markets and freeze them. Use more green beans, canned lima beans, or another vegetable in their place. This is the kind of salad that people love at family reunions, potluck dinners, and cookouts, or keep the salad chilled in a cooler and take it along to a tailgating party or picnic. Chickpeas are another good bean to add to the salad. They add a crunchy texture. See the tips and variations below the recipe for more add-ins and serving ideas. Drain the canned green and yellow beans in a colander; transfer them to a large serving bowl. Drain the kidney beans in a colander; run cold water over them until it runs clear. Add the kidney beans to the bowl with the green and yellow beans. Remove the stem and seeds from the bell pepper and chop it. Peel the red onion and slice it thinly. Add the bell pepper and onion to the beans. In a small bowl, combine the vinegar, oil, sugar, salt, and pepper; whisk until smooth. Pour the dressing mixture over the vegetables and then toss gently to coat. Toss the salad until the ingredients are thoroughly coated with the dressing. Cover and chill for at least 4 hours. 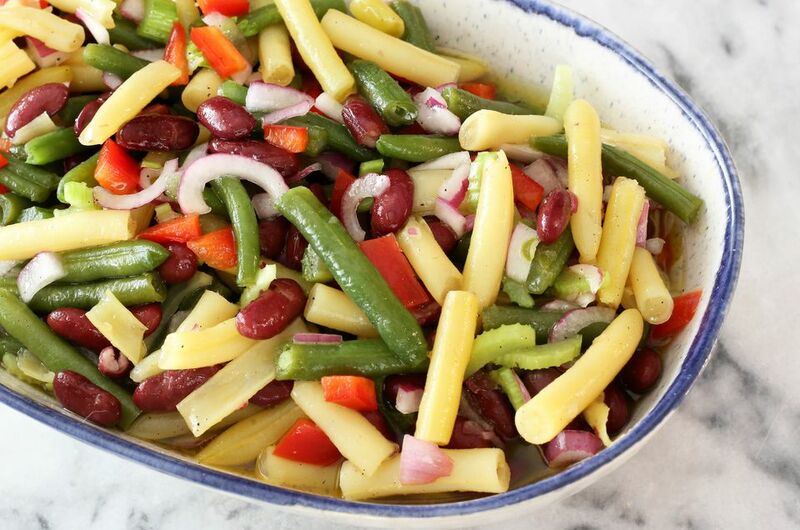 Three Bean Salad With Green Onions - Replace the red onion with 1/4 cup of sliced green onions. Bean and Cauliflower Salad - Omit the yellow wax beans. Cut florets from 1/2 of a medium head of cauliflower and add them to the salad with the beans. Add 1 or 2 tablespoons of drained pimiento to the salad along with the bell peppers. Four Bean Salad - Add chickpeas, black beans, or white kidney beans to the salad. Garnish the bean salad with hard-boiled egg slices, diced tomatoes, fresh chopped parsley, crumbled bacon, or pepper rings. Serve the salad on romaine lettuce leaves with tomato wedges or avocado slices.